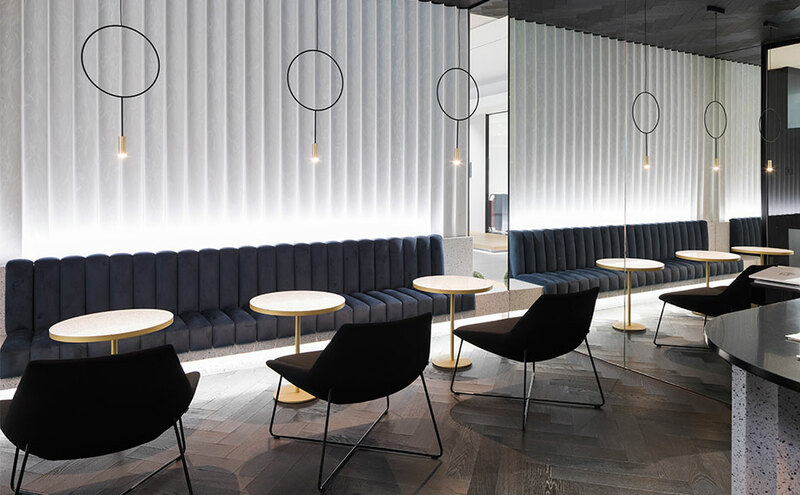 Interior design and architecture projects which are geared towards contract spaces must count on not only high quality standards, but also carefully-worked aesthetics which can project the image that each business wants to show. Design is one of the other key factors when it comes to choosing the materials which will shape a contract space. The possibility of meeting client demands regarding shapes, colours and finishes makes the work done by interior designers and architects easier, who look at creating atmospheres which match the identity of the company 100%. As well as that, since we are dealing with medium-high traffic atmospheres, the contract spaces demand highly durability materials whose appearance remains unaffected during their service life. In order to achieve this, the aforementioned materials must be resistant and have easy-to-clean properties, as well as low maintenance, so that the everyday use of the space does not have an effect on either the colour or the finish. Although material quality is key when it comes to making the right choice, the support given to professionals is of equal importance so that they can carry out their projects in an excellent way. Here at Krion, we are aware of the needs that interior designers, designers and architects may have whenever they carry out a contract project and this is the reason why we strive to give aesthetic and functional solutions which enhance their work. Aesthetics is key in the contract sector. Each brand has its own identity which must be portrayed in the space. For that purpose, Krion counts on the Ad Hoc service, where you can find specific and unique Krion colours for big projects, allowing each business to be different from the rest in the sector. The adaptation to the space is also very important in a material, since professionals sometimes have to deal with small areas, corners in difficult places and particular specifications. In this regard, the thermoforming benefits of the KrionTM mineral compact, along with the possibility of having customised furniture, make it easier for designers and architects to successfully meet client requirements. Backlighting is another benefit which Krion counts on, since it is possible to include the logo of the company on the same surface without creating unnecessary joints, therefore achieving unique finishes in the creation of an incomparable professional atmosphere. Going beyond aesthetics, the material that shapes a contract space must fit in with a series of essential requirements. The full-body condition of KrionTM allows for the material to be easily repaired when there are scratches, stains and superficial burns. A property which, together with the zero porosity, ensures easy cleaning, hygiene and safety for the material against bacteria. The quality of the material also lies in the resistance it shows when compared to other materials used in the contract sector, namely: wood and methacrylate. Unlike these, Krion does not suffer from corner spalling and it remains unchanged over time. The colour stability is assured due to the research in ageing machines which allow us to know how the material would age over time, and furthermore, how to prevent it from happening from the get-go. For professionals who design a contract project, their final objective is to carry out work which makes customers feel satisfied with everything. To achieve this, we must understand each one's priorities and carry them out with maximum efficiency. At Krion, we have the A&D department, which advises and supports designers and architects throughout the whole process. In relation to the economic aspects, A&D oversees the advise given, and the investigation regarding the viability of the project. This is done in order to encourage profitability for all participating agents, through optimisation actions. Technically, professionals have the experience of the Krion team at their disposal, in terms of the material possibilities, and furthermore, they also have unlimited access to the BIM brand library to streamline the creation process. In addition, the department helps to solve any doubts or unforeseen circumstances that may arise in a project, providing a quick and agile solution to positively influence the workflow. To sum up, Krion starts a circular economy plan which favours each of the different professionals participating in a project. A plan in which the company becomes another link in the chain with a clear objective, which is: to work on improving user experiences on an aesthetic, functional and beneficial level.